Great Scott! This is amazing! 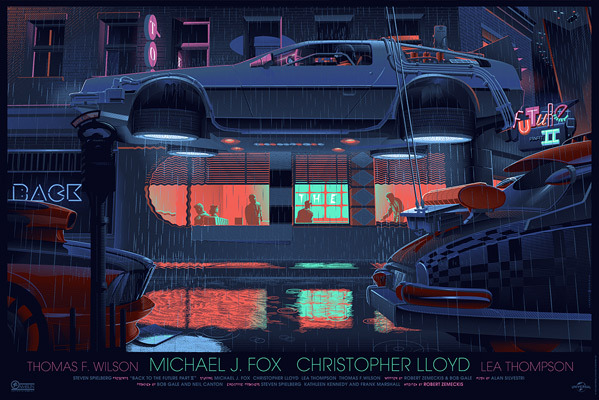 Mondo has outdone themselves, once again, with a stunning poster that I must get my own print of. For one of their upcoming gallery exhibitions down in Austin this month, Mondo is featuring French artist Laurent Durieux solo. We love his work and so does everyone else and he's already responsible for a number of famous prints, including The Birds and Die Hard. Our friends at SlashFilm have revealed the Back to the Future Part II print from his trilogy series and it's just about perfect. From the colors to the composition to the DeLorean itself, I am totally in love with this art. I want it on my wall now! Here's the new Mondo Back to the Future Part II print by Laurent Durieux. Original with variant below. Back to the Future Part II, directed by Robert Zemeckis, was released in 1989 following Back to the Future in 1985. Michael J. Fox and Christopher Lloyd return as Marty and Doc, respectively, and head to the future this time around. French artist Laurent Durieux designed an entire series of Back to the Future prints for the whole trilogy, which will be revealed leading up to his gallery opening this weekend. Durieux is one of our favorite artists working with Mondo, and this will likely be one spectacular exhibition of movie geek art. ...beyond beautiful. Billington get it for me! Where this is, it needs to be huge. Awesome work.